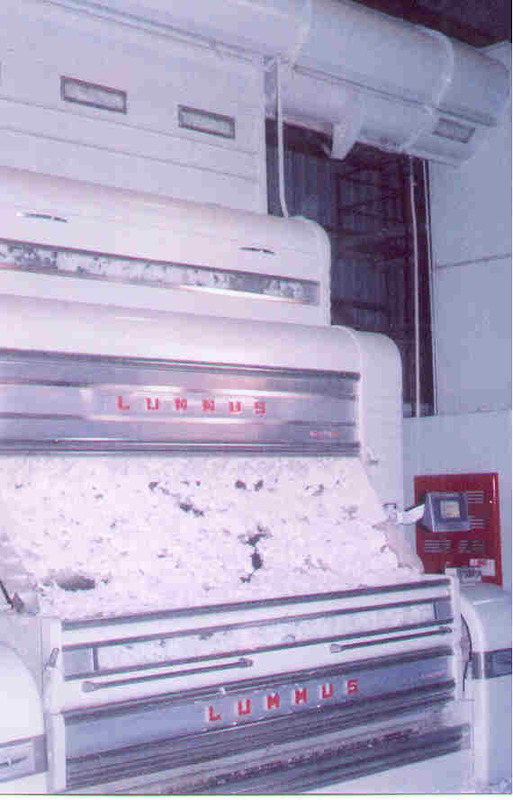 Ginning is the process of separating lint and seed from cotton produced on the farm. Lint is formed into 500 lb. bales, which are sold to textile mills. Seed is sold by the ton to buyers such as dairies, which use it for cattle feed, and seed companies, which sell the seed for next year's crops. Some cotton gins also sell seed to oil mills, which produce cottonseed (vegetable) oil, but there aren't any oil mills in our area. At Glenbar Gin, the season begins in March, when the growers begin purchasing seed from us to plant in their fields. 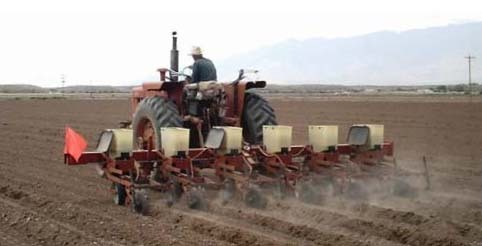 Planting generally occurs in late March and the entire month of April. 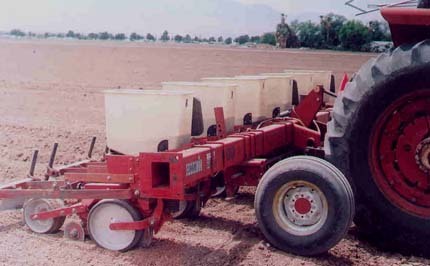 In the cotton planter shown below, the seed is placed in the square plastic hoppers. Below the hopper, just in front of the larger white wheel is a blade that cuts a furrow into the soil. 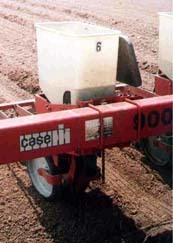 A mechanism hidden by the white wheel places the seed into the furrow, and a pair of discs set at an angle, located just behind the wheel, cover the seeds with soil. This part of the website is under development. Photos will be added as the 2008 growing season progresses. 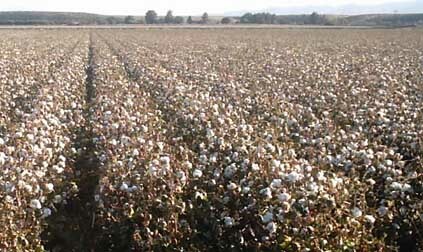 The cotton crop grows until sometime around the end of September, and then the grower defoliates and picks the cotton. Cotton is harvested using a machine called a cotton picker. This harvested cotton is called seed cotton, because it still contains seeds. The cotton picker normally unloads the seed cotton into a module maker, which presses the cotton into a module, a roughly 8 ft. wide, 32 ft. long, 8 ft. high block of seed cotton. Some newer model cotton pickers make 16 ft. long modules directly. The module is covered by a tarp to protect it from rain. Modules are held together only by compression. There is a kind of truck that can pick up a module by backing up underneath it. The truck has a tilting bed full of slowly turning wheels. After the module is made, a module truck from Glenbar Gin comes and picks it up. The module is unloaded in the gin yard and waits for its turn to be ginned. This sequence of pictures shows a module truck picking up a module in the yard and taking it to be ginned. The cotton modules are placed on the module feeder. The module feeder breaks the cotton up, so that suction can pull the seed cotton into the gin. The suction pipe is on the right side of the photo and is roughly 24 inches in diameter. The seed cotton goes through dryers and cleaners on its way to the gin stand. The gin stand separates the lint from the seed. Glenbar Gin processes two kinds of cotton, and each goes through a different kind of gin stand. 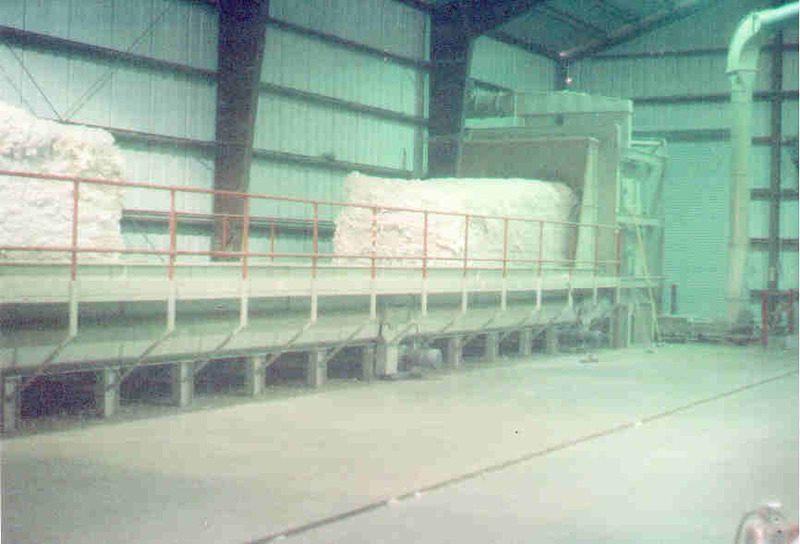 Upland cotton has a staple (fiber) length of 1 to 1 1/4 inches and normally goes through a saw gin. 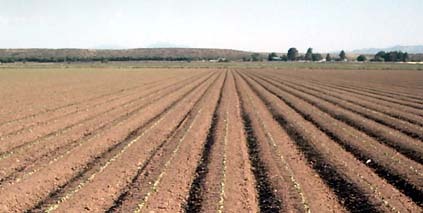 Pima cotton has a staple length of 1 1/2 inches or more and normally goes through a roller gin. 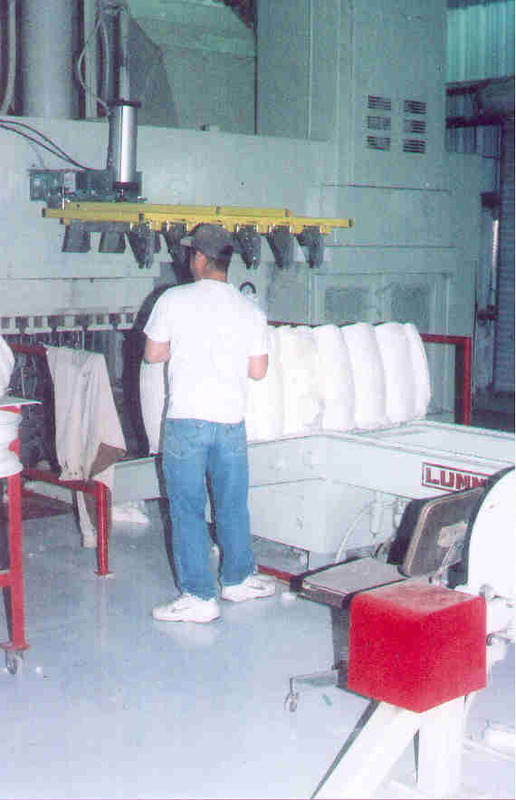 Saw ginning is generally faster and more economical than roller ginning, but roller ginning is gentler on the cotton. 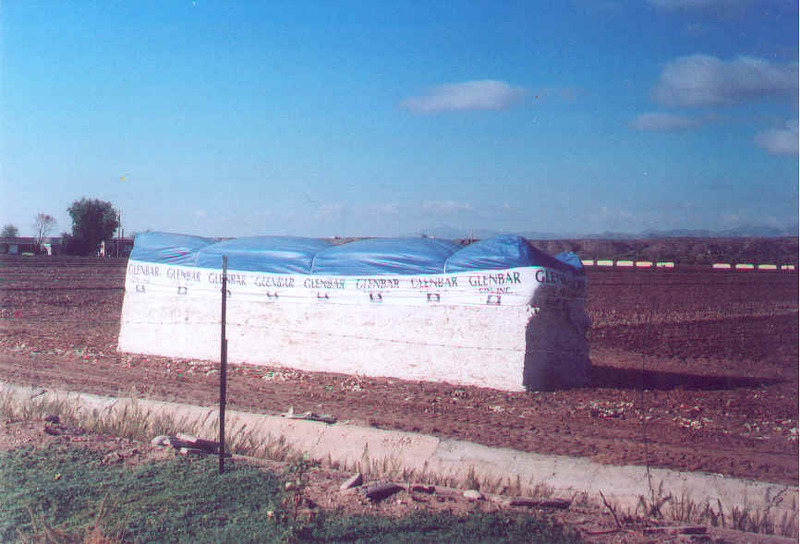 The roller gin preserves the longer fibers in the Pima cotton. This picture shows upland cotton going through a saw gin stand. Seed is loaded onto trucks. Lint is pressed into bales. A sample is taken from each bale and sent to the USDA Classing Office. The Classing Office measures characteristics such as staple length, strength and color and returns this information to the gin. The classing data is used for marketing the bale. Bales on trailers, ready to be shipped to the warehouse.